We believe high-quality design is a collaborative process that should be available to everyone, no matter where they live. So, we developed a set of tools that lets us work with you online. Over screen-share meetings, we will show you the evolving design of your home, taking the time to discuss your comments and questions. We will guide you through each design iteration and let you know what is happening each step of the way—and why. You can either choose to modify one of our standard designs in our Axiom Series, or work with us to design a completely custom home. We work with local planning and building departments to procure setback, height, zoning restriction information, etc. We then incorporate this information into a 3D digital site model. We meet you at your site to discuss any pertinent details of your particular piece of land that should be considered during design. Together, we map your dream for the site and how you envision making a home there. We create a 3D digital site model of the building site and its immediate environs that includes digital schematic representations of site features: topography, setbacks, neighboring buildings, views, solar orientation, and more. This first-rate tool enables you to visualize your future home, capturing views from inside and outside the house, and showing the path of the sun at any given time on any day throughout the year. 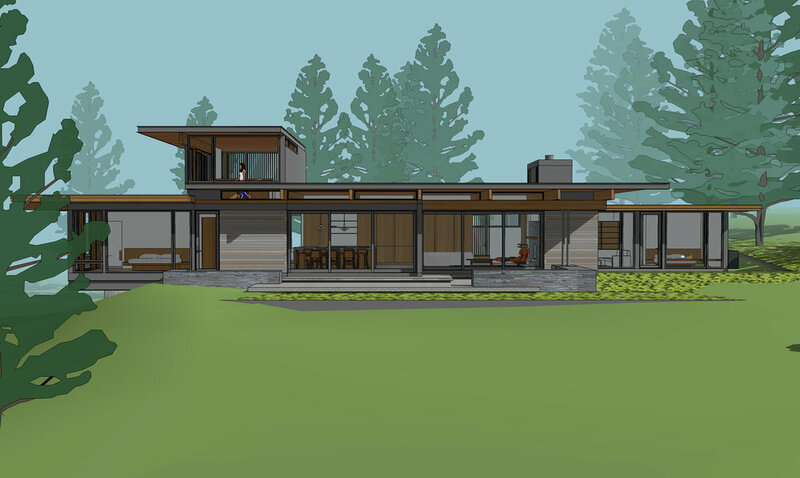 Using approachable imagery in a 3D digital model with plans and 3D views, we will work with you to create a design you love, from organizing spaces to walking through the final design—whether starting with an existing model or creating a custom design. Given a wide array of cladding options, we make selection easier by creating a 3D digital cladding study so you can visualize various materials, configurations, and color schemes. We help you understand the materials and their properties—and explain the characteristics of each option so you can make an informed decision. If our clients choose to build their homes in complex regulatory environments, we help navigate the process by creating detailed diagrams to satisfy even the most stringent requirements. Our 3D models enable us to clearly communicate how our designs meet local regulations, through recession plane diagrams, storypole diagrams, cut-and-fill diagrams, parking diagrams, and more.